Jenn Shelton is a Notary who loves the open road. 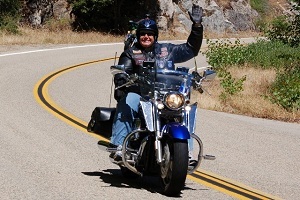 Whether riding for business or fun across California on a touring bike, motorcycling is an important part of her life — and one that’s helped her network with signers looking for Notary services. But like many of the roads she cruises, her life has taken some twists and turns — often unexpected. A longtime resident of Sacramento, California, Shelton’s first job was driving a forklift in a warehouse — but she decided she wanted to get out and see more, so she became a long-haul truck driver. Unfortunately, an injury forced her to change jobs after eight years on the road. She switched careers and joined the staff of a law firm. But while Shelton was no longer driving long distances as part of her job, the thrill of travel still called to her. A group of friends enrolled her in a motorcycle riding class as a birthday gift. “I got my license, and I was hooked from there,” she said. She started with a sport bike but switched to a more substantial touring bike to be more comfortable on long trips. Though she has a full-time job in addition to serving as a Notary, Shelton says she still does a lot of mobile notarizations, and often shows up for assignments on her bike.